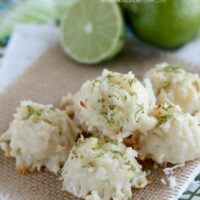 Coconut Key Lime Macaroons - Dessert Now, Dinner Later! So I let you all have a little break since I last posted about my lime addiction. Remember how I shared some Key Lime Pie Ice Cream and Key Lime Poke Cake? DELICIOUS! 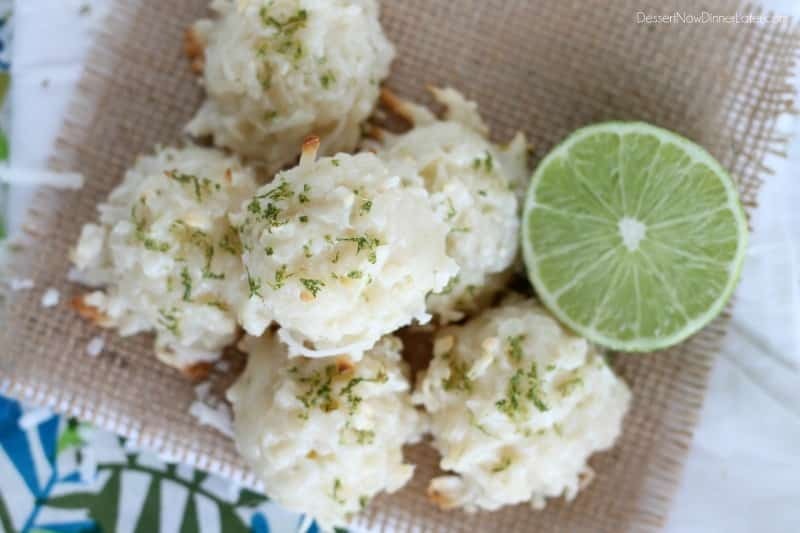 Today’s recipe for Coconut Key Lime Macaroons is mind blowing! 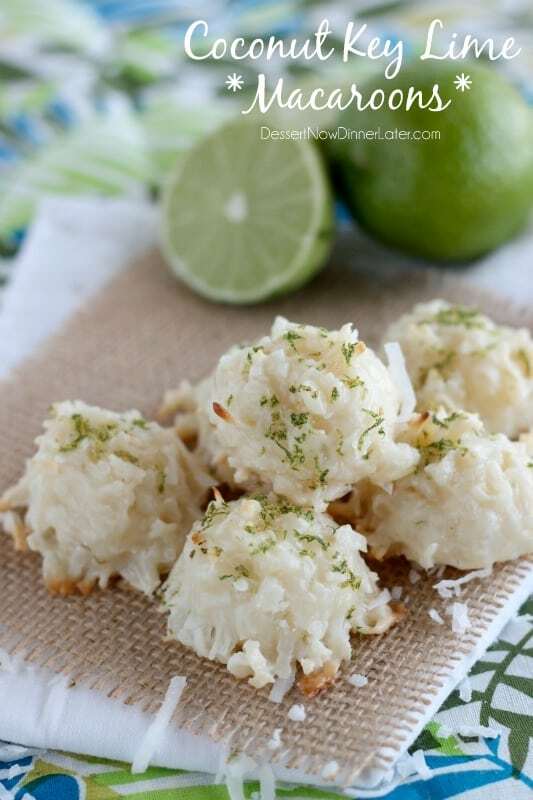 Like, my friend Jessica at A Kitchen Addiction posted these Coconut Lime Macaroons to her site, and it was like our souls united! 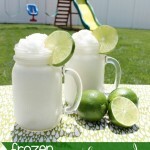 You all know I love lime, but Coconut-Lime is like the perfect pair! 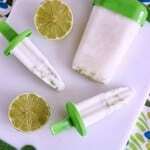 Try my Frozen Coconut Limeade and tell me it’s not the best flavor combination in the whole world! I am crazy in love with these cookies! They were everything I hoped they would be! Sweet and coconutty with the perfect tang of key lime! My husband took the leftovers to work, because I taste everything and then send it out of our house so I don’t get fat, and EVERYONE raved about them! I think he mentioned someone saying they were, “the best cookies” they had ever eaten! I can definitely attest to the fact that they are top notch! As much as I love coconut-lime creations, I do love a good caramel pretzel chocolate chip cookie, but these are my favorite fruity cookies for sure! These would be the perfect elegant summery dessert for a baby shower or party, or anything for that matter. Make up an excuse to make these! 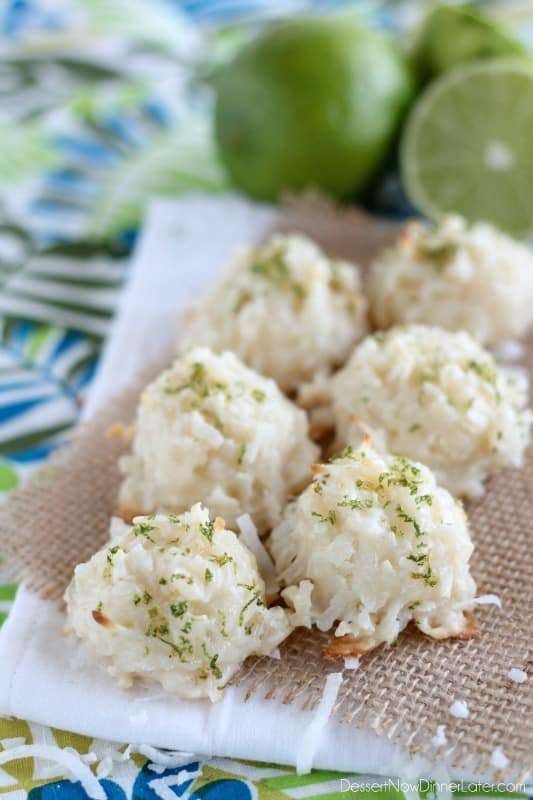 Combine sweetened coconut flakes, flour, salt and 1 Tbsp lime zest in a bowl. Mix thoroughly. Using a #50 scoop (about 1½ Tbsp), scoop cookie dough balls onto a greased or lined baking sheet. Sprinkle the tops of the raw macaroons with the remaining zest on top. Bake at 350*F for 12-15 minutes or until the edges and bottom of the cookies are browned. Allow to cool completely. Enjoy! Great recipe! Coconut and lime go so well together. I love how easy this recipe is. Thanks for sharing! Oh girl…. You are KILLING me with the key lime posts. YUM YUM YUM. I need to try that ice cream. ASAP. Love your guts. You should move by me, I would share all my lime treats with you, muah! Mmm these look so delicious Amber! I need to try these and pronto! I love a good macaroon and adding key lime sounds divine. I was totally going to try these with the coconutty macaroon mix next time! They are so good! Wow these look delicious. Can’t wait to try them! Wow they look so pretty… and so yummy! Thanks for sharing! 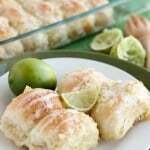 You’ve got me hooked on coconut lime desserts! oh this is a great macaroon flavor! I love macaroons. What a fun flavor combo to use. These look fantastic and surely taste the same! I just made these and they are amazing! My whole house smells delicious. Great, easy recipe! I hope you liked it! They are super easy and full of flavor! Loved these! Yep, they came out great! everyone loved it! Recipe looks delicious, definitely gonna try. One thing however, I would suggest using fresh limes (key or “regular” Persian) over the bottled “Key West Lime Juice”, which is exactly what the bottle says. Concectrated Persian lime juice (confirmed on the ingredient list) which has been reconstituted, preserved and bottled in (guess where?) Key West. It makes no sense from a culinary perspective to purchase a processed version of what you can purchase at the local grocery store (high prices aside) fresh. After all, isn’t that the direction were trying to go with food? Cheers. Just pinned this recipe on Pinterest. Looks amazing. Can’t wait to try it! Thanks Deb! It’s a great one if you love tangy-sweet desserts! these look so good! I want to make them for my wedding welcome bags. How far in advance could I make them and would they freeze well? Thanks! I haven’t frozen them myself, but if you do, you will definitely want some wax paper between the cookies, don’t stack them right on top of each other because I bet they will stick. I wouldn’t freeze them for more than a month before the wedding. You can always do a test batch to see how they do. Good luck! Put the lime in the coconut! I’ve been looking at your lime and coconut desserts and I want to try them all! 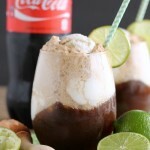 I love lime and coconut! I don’t know if you drink, but a couple of weeks ago me and a friend of mine made Jello shots and we used different flavors of spirits with the different flavors of Jello. My favorite by far was coconut rum with lime Jello. Yum! Coconut and lime is a fab combo! Hope you enjoy these Brian! These are so delicious ♡. Used fresh key lime juice. So simple and so good! So glad you enjoyed them Courtney! Thanks for your comment!